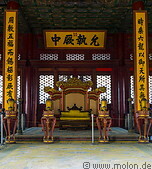 The Forbidden City (紫禁城, Zǐjinchéng, also known as Gùgōng 故宫), is the former imperial palace of the Qing and Ming dynasties (1420 to 1912 AD). 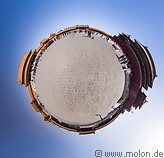 It is located centrally in Beijing and is surrounded by a moat. The compound has a rectangular shape, extending for 961m from north to south and 753m from east to west. The visitor access is at the southern gate (the Meridian gate), the exit at the northern gate. The Forbidden City was built under the Ming emperor Yongle between 1406 and 1420 and consists of 980 splendidly decorated buildings. 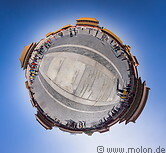 Only the central part of the Forbidden City is accessible to visitors, who proceed through a number of gates, courtyards and pavilions before reaching the Imperial garden to the north. A typical visit can take two hours or longer. North of the Forbidden City is the Jingshan park, with a small hill allowing a nice view of the Forbidden City. 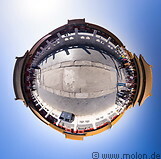 The Forbidden City has been a UNESCO World Heritage site since 1987.